Another patch of Godfest Exclusives (GFE) is being released and features the highly anticipated Eschamali , Scheat , and Australis . In all honesty, the GFE pantheon is becoming too crowded and making it much harder to acquire the ones you actually want. Godfests are now 2 day affairs and splits the GFE evenly between the 2 days. This can make it challenging to roll for your ideal godfest as the GFE cards you want may not be featured with the regular pantheons you are aiming for. Rambling aside, , , and are 3 new and powerful additions who actually feel worthy of the GFE title due to their amazing awakenings and heavily powercreeped actives that combine an enhanced skyfall mechanic with a double orb changer (as well as jammer and poison orbs) to their primary colour. Their viability as leads will be slow to start as we do not have access to enough machine cards and this post will mostly be focusing on their sub potential. Eschamali is the front runner of the 3 in terms of viability and rarity with players going Gungho over the idea of rolling her. Being a 6-star GFE places as one of the rarest monsters to acquire and just be forewarned that you have ~0.34% (22 6-star GFE / 1048 rolls / 6 featured 6-star GFE) of rolling her if the 1048 rolls collected from the previous player’s choice godfest is accurate (full post can be found HERE). Rarity aside, will be game changing for mono dark teams with special mentioning for Awoken Yomi and Yomi Dragon teams due to the unprecedented 7 dark orb enhance awakenings. also has the god typing unlike Zaerog Infinity and will fully benefit from ‘s leader skill. and teams are reliant on abundant awakenings because it is challenging to form additional two prong attacks or dark rows when your board is already constricted by the need to match exactly 5 connected dark orbs. Furthermore, ‘s active acts as a pseudo board refresh (by removing jammer and poison orbs), converting wood and heart to dark orbs, and an enhanced dark skyfall buff for 4 turns. This can replace the need to bring Awoken Haku , , and other large scale board changers. The skill lock resist is just icing on the cake and it is hard to find fault in on any mono dark team as the enhanced skyfall is very powerful with as every orb that falls down will be enhanced. Even without any dark row awakenings, is still powerful on Awoken Lucifer (and Awoken Pandora if you can forgo the devil bonus) teams due to the double orb change and ability to remove jammer and poison orbs. This can remove the need to bring the non synergetic Awoken Haku (most people evolved their D/D form) as the skyfalls add combos to a normally low combo based team. Scheat follows the same pattern of ridiculous awakenings and overpowering active that converts light, heart, jammer, poison, and mortal poison orbs into water orbs along with providing 15% enhanced water skyfall for 4 turns. Awakenings wise, has 5 . No the 5 is not a typo, and in an attempt to control the damage output, has only 653 base attack at max level. 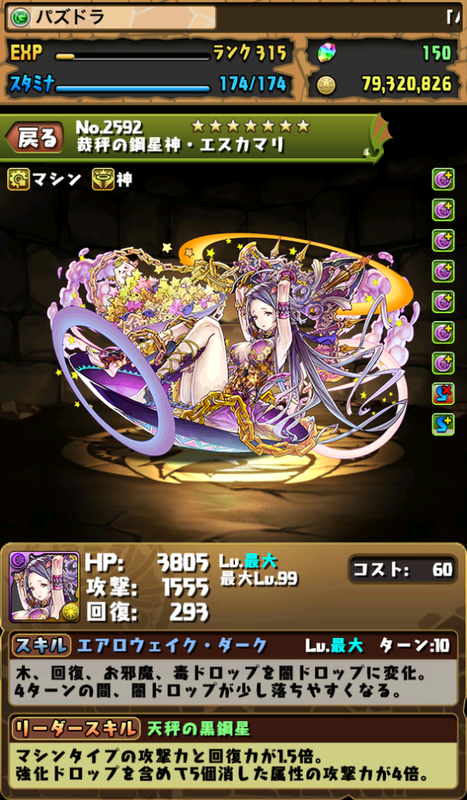 Granted this can be augmented with plus eggs and latent tamadras, but she will still hit like a truck. What is interesting is that she still has 789 weighted stats due to her massive health pool and high recovery. Water based are not that popular although I&I / Ryune both have 2 and it may be viable to include due to her HP and RCV being heavily multiplied. To be honest, the active is powerful enough to almost warrant a guaranteed sub slot on most mono water teams as it functions as a massive board changer and enhanced skyfall mechanic. Australis is pushing the idea that wood row based teams are viable by bringing a walloping 5 and no other awakenings. Currently the only team she can function on is a Sylvie / Freyja as Awoken Astaroth cannot use machine or god types. Row based teams benefit heavily from large scale orb changers as you want to make at least 2 rows when trying to burst a boss down and will almost guarantee 2 unique rows worth of wood orbs. Stat distribution wise, is quite evenly spread and has 780 weighted when max level. Unfortunately, you need to be careful using as a sub because she offers no , skill boosts , or awakenings. This forces you to bring subs who provide these awakenings as you do not wish to become skill locked nor have to stall for too long for actives. Let me know what you think and if you agree with my thoughts and opinons. Nice write-up. My only point would be to mention that Australis will be a great fit to Bankai Perseus teams, once it hits NA, since Perseus has two SLR and two Time Extends. That gives 4 SLRs and 4 TEs if pairing Perseus with Perseus, alleviating the constricting sub pool. I realized I had a mono green team as well and put together Freyja, Australis, Perseus, Meimei and Liu Bei. I’ll see if it works if I can ever find any Sylvie friends. Sylvie is rare to find as she is an unpopular colour and a 6-star GFE. Her team is still powerful but is just less popular compared to I&I/Ryune and Saria/Thor as those teams just have a better sub pool to draw from and came out earlier. Yeah I think for now I’m focusing on the yellow team. I have the best sub pool there and it doesn’t get hit by resists. And I think it has higher potential than every team but purple.